We know nothing about Pandora's early life, her mother, or whether she had siblings. Even her date of birth is a guess based on her size when we first met her. She came into our lives in January 2002. Ivor had gone downstairs to collect the post, and he called me to come and see "a kitten who gives leg rubs". 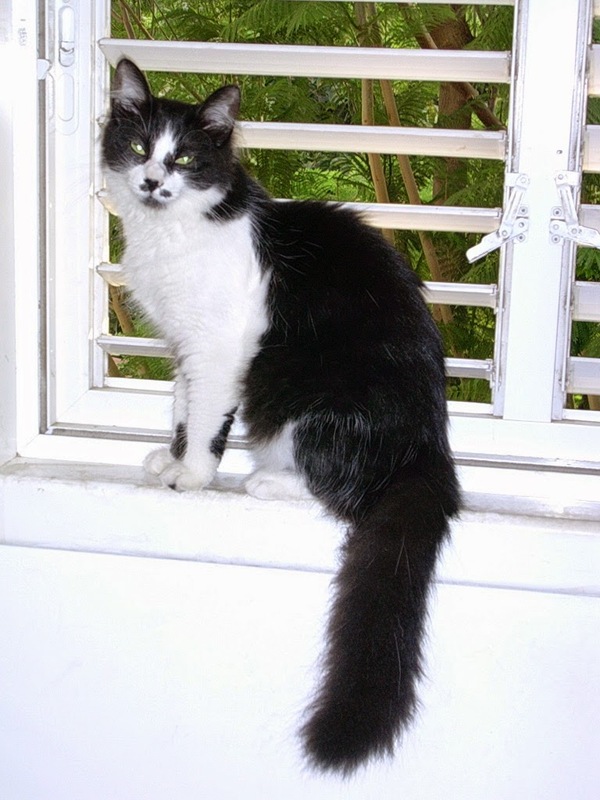 There she was, a fluffy black and white kitten, determined to win our affection and find a home. I picked her up, and she came home with us. 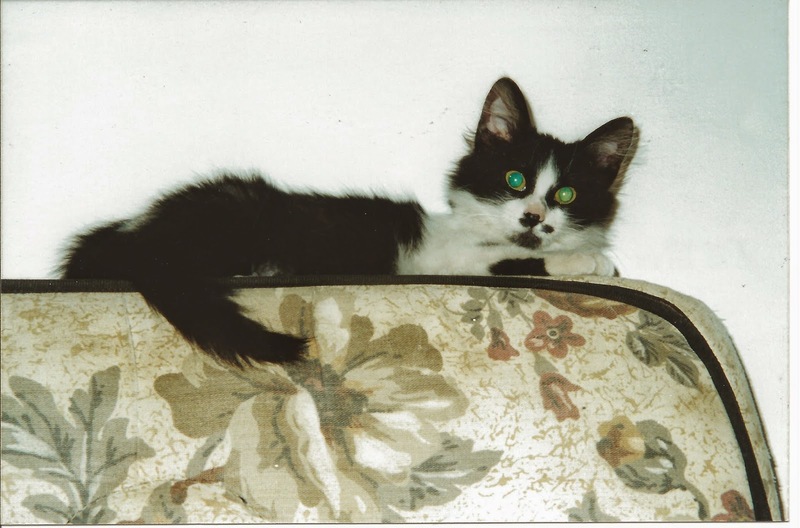 At this time, Eleni was two years old and we had been asking her if she would like a kitten. 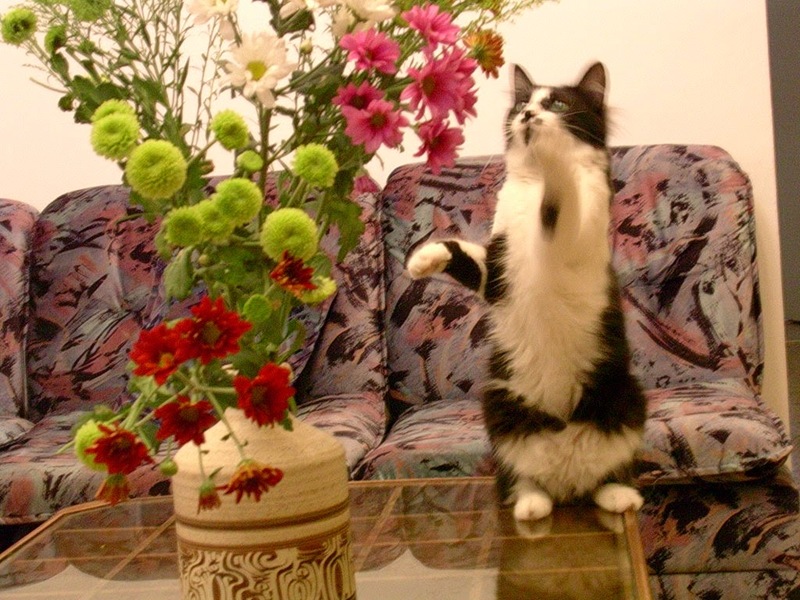 She was our first indoors-only cat, and we thought she was lonely and had become bored. We thought a new kitten would keep her company and make her playful again. It wasn't an easy introduction. At first we kept Pandora in the spare bedroom, and only gradually let them meet each other. Eleni was scared of Pandora, and often expressed this by vomiting. Pandora just wanted to play, but Eleni didn't cooperate. They never really became friends, and only tolerated each other. 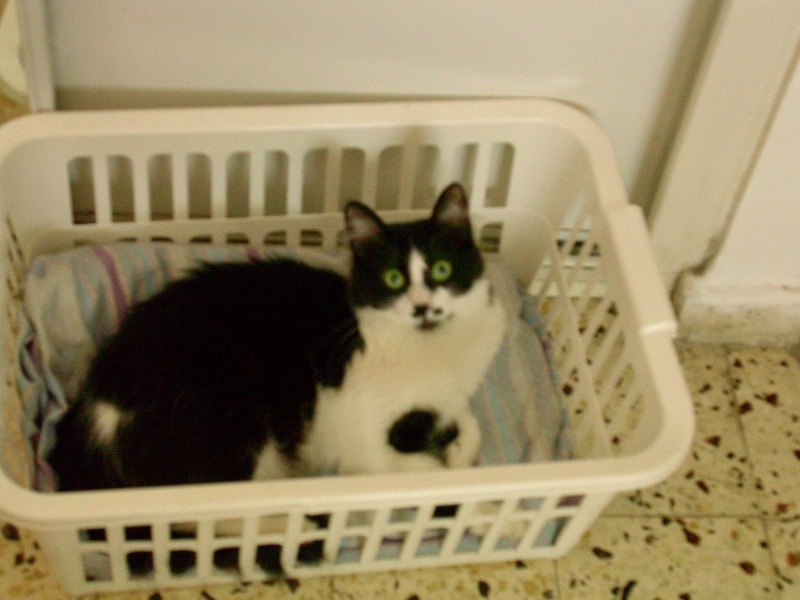 However, we think having another cat in her life did help Eleni develop and become more interested in playing. 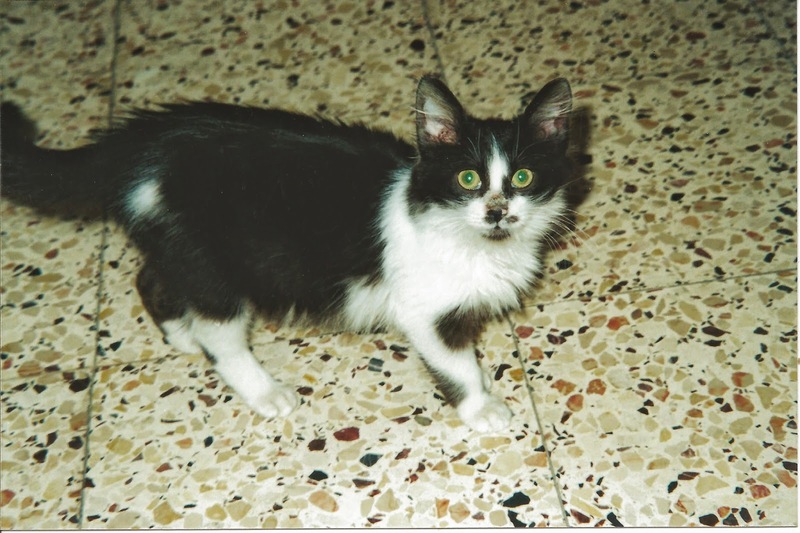 Like many kittens born on the street, Pandora had fleas and worms when she came to us, and it took several months of treatment to overcome this problem. 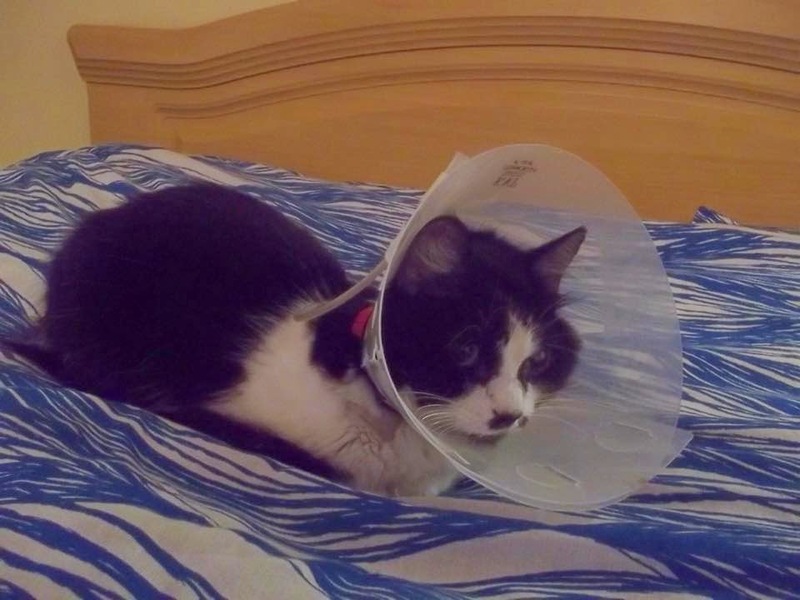 Apart from that, she was a healthy cat for most of her life, and apart from the annual check-up and vaccination, she only saw the vet for a tooth extraction, and another time when she fell and hurt her leg. Pandora was always independent and a bit wild. She accepted our love, but on her own terms. For her first few years, she didn't like being stroked, and would turn around and try to bite. As she got older, she became more touchable. She never enjoyed being brushed, which was unfortunate for such a fluffy cat. She didn't usually sit on our laps, but often sat near us to keep us company. In some ways, Pandora was like a dog. She greeted us at the door when we came home, rolling on her back for belly rubs. She came when we called her, not always, but more often than any other cat I've seen. In other ways she was a typical cat. She enjoyed watching birds and chirping at them, though she never got the chance to hunt. She liked her litter box to be kept clean. She was always begging for food at the table, and loved to eat small pieces of pastrami we bought just for her. Like her namesake, Pandora was curious. She followed us from room to room, and investigated anything new in the house. When people came to visit, she sometimes hid at first, but usually came out to see who was there and what was happening. The exception to this was my parents. After the cats spent the night at my parents' place while we were moving, Pandora always associated them with a traumatic memory and hid whenever they came to visit. It made me sad that they couldn't get to know her and only saw her being scared. True to her name, Pandora loved boxes. We always had a collection of boxes for her to sit in. One evening, a window that wasn't usually open had been left open by mistake. When we noticed, we immediately started looking for Pandora, and she was nowhere to be found. We spent about four hours searching for her outside, until she eventually emerged from the bushes. We don't know if she jumped deliberately or fell. She never escaped again, but enjoyed spending time on the balcony, under supervision. Pandora often kept me company while I was working. 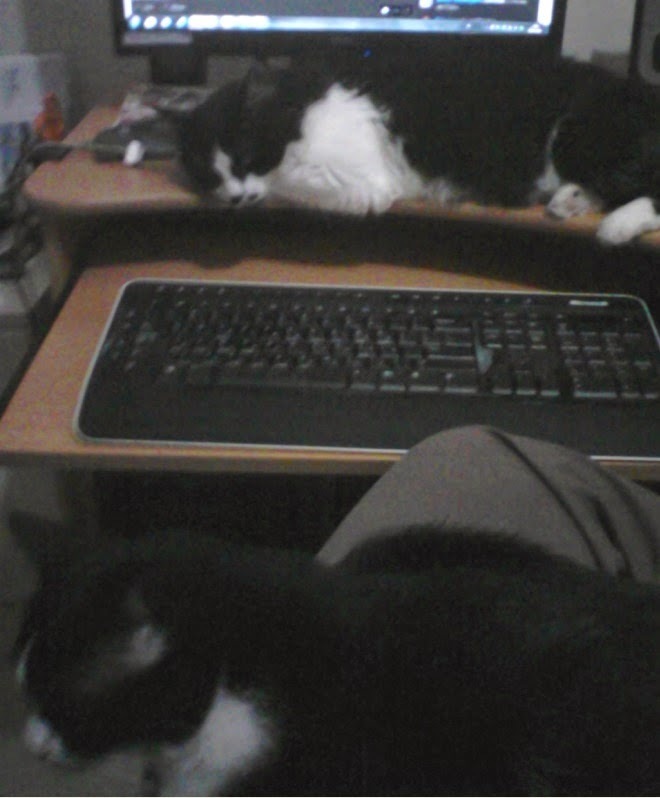 Eleni sometimes sits on my lap, but Pandora preferred to sit on the desk. I liked to say that I had both models of cat: a desktop cat and a laptop cat! For nearly three years now, I have been watching the Foster Kitten Cam, and Pandora loved watching the cats and kittens with me, sometimes tapping the screen with her paw, sometimes looking behind the screen to see where the kittens had gone. Pandora's illness came on suddenly, just three and a half weeks ago. I noticed that she wasn't eating, had become apathetic, and generally didn't seem her normal self. An ultrasound scan found that she had enlarged lymph nodes, and we were told this could be caused by either IBD (an autoimmune condition) or lymphoma (a type of cancer). Since the treatment for both conditions was the same, a combination of steroids and chemotherapy, we decided it didn't matter what the cause was, and we didn't want to put her through exploratory surgery to find out. The treatment didn't seem to help. She didn't regain her appetite and continued to lose weight, so she had a feeding tube inserted and we fed her through the tube for a few days. As in the myth of Pandora, the last thing to remain in the box was hope, and we hoped for an improvement, while being aware that the end might be near. It soon became clear that nothing was helping and she was in pain. This morning we took her to the vet for the last time, and she was put to sleep. The vet said that her not responding to any of the treatments meant it was more likely to have been lymphoma, and it could have been very advanced even before any symptoms showed. We did all we could for her. Thank you, Pandora, for coming into our lives. You taught us about love and about independence. You will be remembered and missed. Oh I am so sorry sweetie! Now that I have a dog I know I don't want to lose her ever as she is a member of the family! At least Pandora won't suffer any more!Hugs and kisses!